Not Drunk Enough - Blog - Seen Nothing Yet Kickstarter!! Hey everyone!! 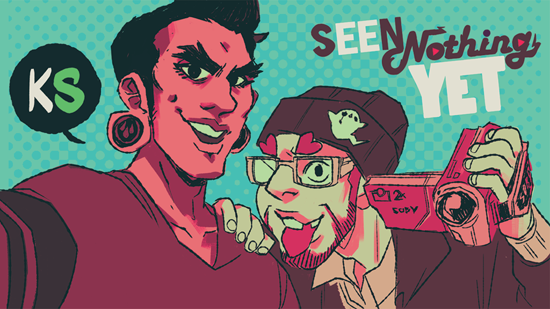 I'm happy to announce the micro Kickstarter for Seen Nothing Yet, my 18+ erotica comic about two boys attempting to be amateur ghost hunters and finding more distraction in each other than anything else...! It's got two goofy dudes, it's got some spooks, and it's got a lot of steam! It can also be found online at Slipshine (18+ only link, please!!). But this Kickstarter is to replenish volumes 1 + 2 for print, as well as print volume 3 for the very first time!! There's extra rewards like a reprint of the ghost charm, a NEW GHOST PATCH, and also a chance to get original drawings of these dweebs. Thanks, as always, for your support! You guys are all amazing and love you all!! !